You'll need a few things to create this illusion, starting with a body of water. In SketchUp terms, that means a surface you can paint with a transparent material. Make sure that you also have a ground surface for your objects to sit on. Select the objects with the Select tool. Press M to switch to the Move tool, start moving them, then press the Up or Down Arrow key on your keyboard to lock yourself in the up/down direction. While still moving your objects, press the Ctrl key (Option on a Mac) to make a copy of the objects you're moving. Drop the copies in space somewhere above the originals. With the objects still selected, press S to switch to the Scale tool. Drag the top, center scaling grip down (see the image, above), "squashing" the objects until they are "inside out". Continue scaling until you see -1 in the Value Control Box (in the lower-left corner of your modeling window). Now the copies are mirrored. Select the copies and move them straight down so they are directly under their original counterparts. Finally, paint the water surface with a transparent material. You mirrored the objects below the ground plane to create the illusion of a reflection. Orbit around to get the full effect. Create a large surface (larger than your water surface), and paint it with the same transparent material you used for the water. Create several copies of the new, larger surface below the original water surface to create the illusion of depth. By doing this, your reflections will appear to fade away. Hint #1: Play with the distance and number of copies of the water surface to get more or less of this effect and adjust the opacity of your materials as well. Below, you can see the effect of simulating water depth in the image on the right. Hint #2: Remember that if your ground plane is sloping, you may need to mirror it as well. You can see in the example below that I mirrored the entire hill and trees to get good reflections. Turning on fog resulted in a pretty nice scene. 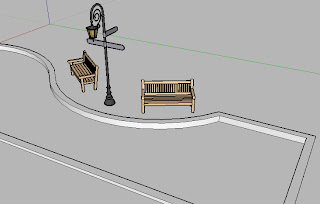 So, the SketchUp team clearly knows that SU is missing this functionality... Does that mean that it'll be be built into the next version, or is this "hack" going to permanently be the official way to do reflections in SU? Don't get me wrong, though. I don't want to sound ungrateful for the post. I hadn't thought of that, and I just assumed that was something I wouldn't be able to do at all in SU. Thanks. where there is no depth to copy/paste objects to reflect? 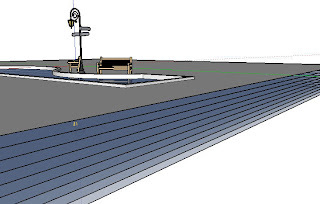 just a thought....go buy Sketchup Podium, it's cheap, has some cool features, and provides an easy way to create "reflections" within the Sketchup program. I think that your white lines are due to your background color in the style being set to white. Try going to window > Styles > Edit and change your BG color to something like gray or black. I've seen this workaround before on go-2-school.com and I always thought the objects you wish to be reflected ought to be combined in a component before creating the "mirror image". This way you can add anything to your objects on top, and there's no need to do the work all over again for every new object you add. I've also had this problem due to interior surfaces showing through at edges and angles. My fix is to either remove the interior surfaces or to paint them black.